​As part of its preparation ahead of the forthcoming local government election in Kaduna State this July, a non-governmental organization, Gender Awareness Trust (GAT) has organized a 2-day capacity building for Kaduna women especially those who may be eyeing one political office or the other in the state. The capacity training workshop has in attendance women and young men from all walks of life fully represented in group work and presentations aiming at arriving at action plan that will be testable in the lg election. 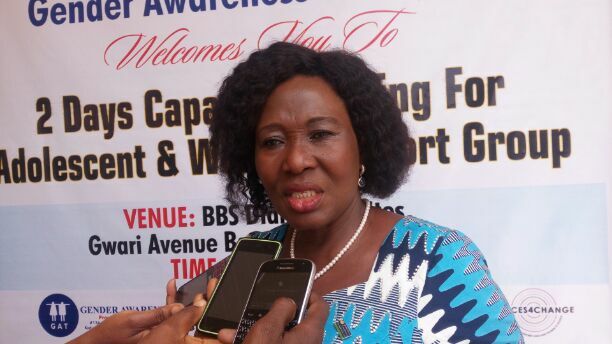 In an interview with newsmen, the Executive Director of GAT, Dr. Lydia Umar said, the capacity building training for women in the state became necessary to prepare them and to canvass support for them particularly those with interest in political sphere of the state. According to her, Kaduna women have been lagging behind in governance where any decision made by their representatives will be bounding on them and their children noting that, it is high time they woke up to the reality on ground and strive to be part of the decision making in the state for the betterment of their people and society at large. To achieve this she said, all the issues that have been hitherto hindering them have been identified and being currently addressed as mush as possible in order not to lose out completely as witnessed during the last house of assembly election in the state. According to her, “we are here for a 2-day capacity building training to provoke women to take their rightful position in leadership and governance. “You can imagine, no single female representative at the current Kaduna state house of assembly. Mind you, any decision taking whether favourable or not favourable to women and children will bound on all of us. “So, one of the expectations at the end of the training is to see credible women many of whom are already doing very well in their respective callings with integrity can come out while others support them to participate without any intimidation from any quarter. “This is not the first time we are organizing this kind of training, but we want them to be more closer to one another, discuss politics and see where they can come together to support who among them dim it fit to contest any elective position starting from the local government. One of the resource persons, Mrs. Rebecca Sako John said, “what we want to see happening is that, the flame has to be kept burning. We are going to use the local government election as a test case of the viability of this platform to mobilize around women and support women across political parties. “That is what we hope to see at the end of this meeting that, people will be committed to ensuring that women get the contest for election at the primary level, get the ticket and mobilize to support women. That is what we hope to get come July 2017 lg poll”, she hoped. Also speaking. President, Market Women Association, Kaduna State, Mrs. Sarah Benjamin Ayuba promised to mobilize market women in Kaduna to rally support for any female candidate with proven good character to represent them in government. “Women generally know the pain they are going through when they are not appropriately represented at any level. We have identified that our problem is that of societal one and we are doing everything legally possible to address it and that is one of the reasons we are here today in our numbers. We need all stakeholders to support female candidates with our husbands and children as the first point of call. “This is because when you empowered a woman, you empowered a nation. When a woman is there in leadership, she knows what to do as a mother, sister, nurse, manager and what have you to make the state and the country at large a better place for all. “As market women, we are there to support any female candidate that come up. Female leader with integrity. We will not support any female politician with questionable character who may fail to deliver”, she added.